Amy Grant Better Than A Hallelujah guitar tab by Jeffrey Thomas. Learn the complete song structure following the studio version of this awesome ballad. I have created a solid version for a single guitar that sounds great! Amy Grant is one of the most popular Christian Music artists. If you would like this Christian guitar tab for free just send in your email using the form provided. Looking for online Christian guitar lessons? Fill out the Schedule A Free Lesson form to set up your free Skype guitar lesson today. “Better Than A Hallelujah” was released in 2010 and reached number 8 on the Christian music charts. 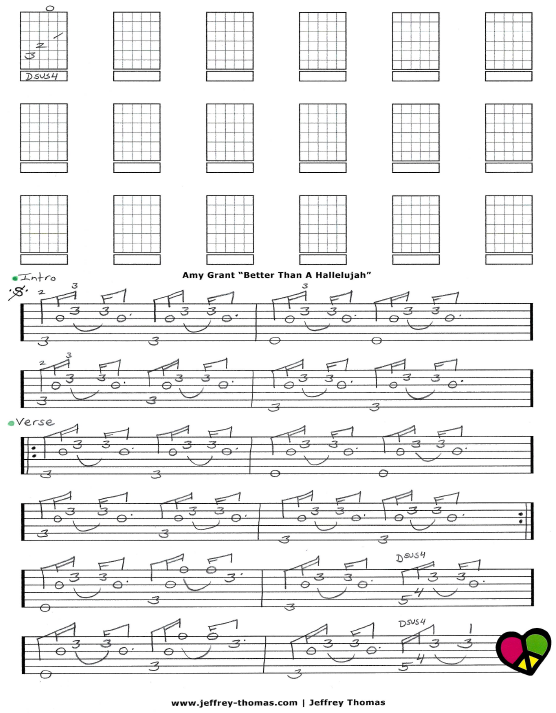 Find more cool, unique online guitar tabs on my tab, blog and video lesson pages.